I am pretty good at keeping secrets. I've learned about people being pregnant and not said a word. I've heard pretty juicy gossip about coworkers and not spread it. I am a good southern lady, after all. There are two exceptions to this, however. I am terrible at not telling things to my husband, and I am really bad at not revealing my "secret" ingredients...especially to my husband. So when I made these brownies recently I could not stop myself from doing just that when he said, "These are good. How do you make them?" He was right to be suspicious I guess. Why would I make brownies for no reason? It wasn't anyone's birthday or a holiday. It was just Monday. The real reason I made them? I found a recipe on pinterest for zucchini brownies. That's right, I could get him to eat zucchini without begrudging remarks or having him just put four slices on his plate and swallow them in one bite. I could really get him to eat zuchinni. But, my ruse was foiled by my own excitement. How did I answer his simple question? With a gleeful "I made them with zucchini!" I mean I practically screamed it. But you know what, he finished them. And he had another one the next night. 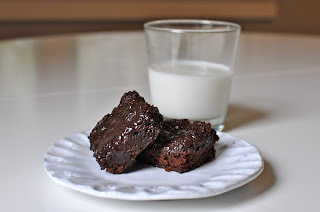 They were so ooey gooey delicious that me, the kids, and my husband liked our fingers clean of those zucchini brownies. 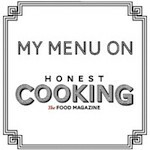 You can find the recipe at this link to Mommy? I'm Hungry's blog. One warning, I wouldn't make the frosting again. The comments have some good suggestions on different recipes for that part that are less chocolate soup. But otherwise, I recommend giving these dark beauties a go and not keeping their secret to yourself.